I love this time of year. When I was younger it was because of the presents—let’s face it, who doesn’t like to receive a gift? But now that I have children of my own, it’s more about the giving than receiving. The best part of Christmas for me is watching my daughter and son’s faces light up on Christmas day when they rip off the wrapping paper. The night before, we go through the rituals of putting out the beer for Santa and the carrot for the reindeer. They double check and triple check that their stockings are where Santa can see them, and they get so excited it makes my heart smile. I also truly believe that it’s not the gift itself that makes Christmas so magical, it’s the act of giving, because isn’t that what it’s really all about? I much prefer to give than receive, and for me, giving someone a gift that I’ve selected just for them fills me to the brim with happiness. 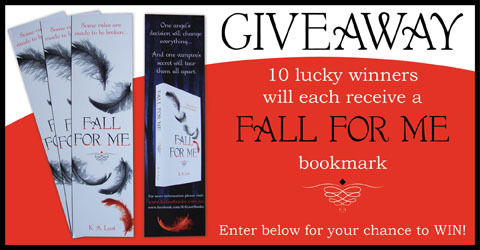 Because I love to make people smile and I love giving presents, I’ve decided to run a week long giveaway. 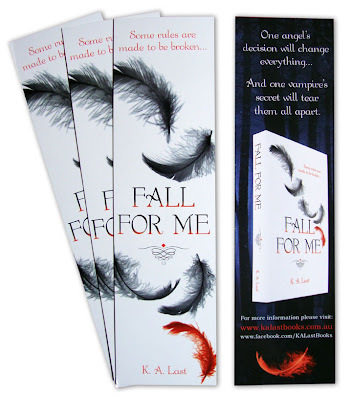 You could have the chance to win one of ten Fall For Me bookmarks just in time for your stocking this Christmas. Oh and best present I got? Besides having my healthy girl just before Christmas (she is grown now, but still remember it) I guess the latest best one would be my Kindle Fire last year, as I am a book lover, and love having so many books on hand at all times. Thank you Michelle for your wonderful support. I don't have a Kindle, but I recently got an iPad for my birthday and love having access to so many books! I wasn't sure who Troy Aikman was, so I had to Google him! American football is quite different to what we have in Aus. I'm not really a big sports fan myself, but if I do watch the footy I prefer AFL to rugby league. Thanks for entering the comp.